With ten sub weapons and seven special weapons, there's many combinations to be found within Splatoon. There's certainly more than I can list in this poll so I've decided to make two polls, first there's this one, for favorite Sub weapon. Then there is a favorite special weapon poll found here. Which are your favorites? Is your favorite combination in existence? Maybe it's because I've been using the N'Zap 89 all day but I'm loving the sprinkler. It's a real useful tool. I think my favourite is the Seeker, 'cause it can create passages quickly, allowing me to zoom around more. Too bad it's not in my main load out. Seeker is an incredibly close second. I love the pathmaker. Splat Bomb: I just like the bombs okay, they're usually a bit too slow-moving for my tastes. This one is more instant than the others which can make for a nice surprise attack. Suction Bomb: Seems like the least-useful of the three bombs in my experience, but works nicely in Tower Control mode. Too slow and obvious in Turf War, except to force someone away from a spot (which most subs can do anyway). Burst Bomb: A decent bomb that feels like it uses a bit too much ink for what it does. Seeker: Pretty handy for clearing blind spots and climbing up towers to hit snipers, etc. Also leaves a decent trail to swim through. One of the better specials, I'd say. Point Sensor: This one's like a mini-Echolocator, right? Doesn't quite seem useful enough in my experience--if you can hit someone with it, you'd probably rather hit them with a Burst Bomb or Disruptor. Squid Beakon: A unique and crafty special that works nicely with a few weapons. If your teammates know how to take advantage of it, it can make a big difference. One of my favorites. Sprinkler: My other favorite! The offensive power isn't amazing and it's a bit slow to start up, but it stays around for a good long while if you can stay alive, and can really help you cover distant spots without having to be there. Lots of fun hiding spots for it too, like on ceilings and moving platforms. Pretty darn cool. Splash Wall: A nifty special that I haven't spent much time with, but have been on the receiving end of some pesky blockage. Good defense for choke points and a nice alternative to the Sprinkler. 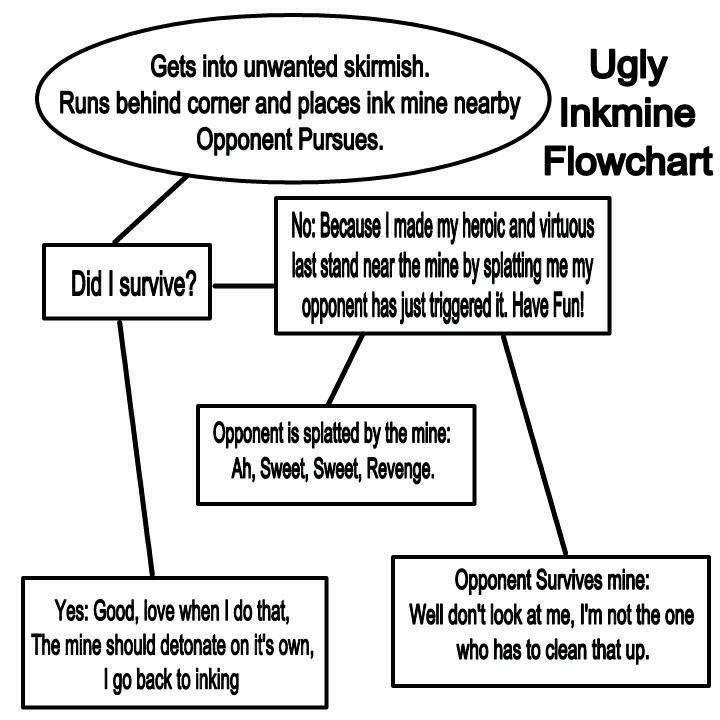 Ink Mine: Can be good if used well, although the limitations on it (one at a time, I believe) and slightly slow fuse make it a bit less useful than it could be. Disruptor: Haven't used it much myself, but I pretty much always die if one hits me. It really screws up your mobility, so if it's easy enough to hit with, I can see this being good. I'll go with the Beakon or Sprinkler. Guess I'll vote Beakon since it's so unique. Definitely the sprinkler for me. It's not so great as an offensive but excellent to cover ground if placed in certain spots. And hey, I've even taken out other players with it too so I'm not complaining Quite hilarious when it happens too. @TriforceBun towards the end of my illustrious Aerospray career I'd gotten pretty good at using them to just mess with people. I'm not much a sub-weapon user. Might be because my loadout has the mines which have their use but require so much ink just to use. I just stick to my Aerospray and Inkstrike. I am your vapour trail. Into the World beneath the battle. Driving you to the centre of Saltspray. Into their sunset-orange ocean we go. I do like it when I do leave a mine and get killed and get to watch the person run over it. Pretty amusing. It's a toss-up between the seeker and the suction bomb for me...but the seeker wins. I have trouble choosing faves, it's easier for me to choose my least fave. I like all the others. Burst bomb I have yet to do anything really useful with. That's the one sub I really don't get. I lean more towards the timed bombs and ink mines. They usually come with the better weapons too. Some subs I'd love to try out more but they usually come with the weapons I'm not as good with. And some eat way too much Ink. @carlosrox I just ran the E-Liter in turf wars and while I'm still not good at aiming the thing (...yet...) I still got two kills in with just the bombs.